Shun Nishide, Jun Tani, Toru Takahashi, Hiroshi G. Okuno, Tetsuya Ogata, "Tool-Body Assimilation of Humanoid Robot Using Neurodynamical System," IEEE Transactions on Autonomous Mental Development, Vol. 4, Issue 2, pp. 139-149, 2012. Shun Nishide, Jun Tani, Hiroshi G. Okuno, Tetsuya Ogata, "Towards Written Text Recognition Based on Handwriting Experiences Using a Recurrent Neural Network," Advanced Robotics, Special Issue on Dynamical System Involving Symbol Processing, Vol. 25, No. 17, pp. 2173-2187, October 2011. Yang Zhang, Tetsuya Ogata, Shun Nishide, Toru Takahashi, Hiroshi G. Okuno, "Classification of Known and Unknown Environmental Sounds Based on Self-Organized Space Using a Recurrent Neural Network," Advanced Robotics, Special Issue on Dynamical System Involving Symbol Processing, Vol. 25, No. 17, pp. 2127-2141, October 2011. Shun Nishide, Tetsuya Ogata, Jun Tani, Kazunori Komatani, Hiroshi G. Okuno, "Self-organization of Dynamic Object Features Based on Bidirectional Training," Advanced Robotics, Vol. 23, No. 15, pp. 2035-2057, December 2009. Shun Nishide, Tetsuya Ogata, Jun Tani, Kazunori Komatani, Hiroshi G. Okuno, "Autonomous Motion Generation Based on Reliable Predictability," Journal of Robotics and Mechatronics, Vol. 21, No. 4, pp. 478-488, August 2009. Shun Nishide, Tetsuya Ogata, Jun Tani, Kazunori Komatani, Hiroshi G. Okuno, "Predicting Object Dynamics From Visual Images Through Active Sensing Experiences," Advanced Robotics, Vol. 22, No. 5, pp. 527-546, April 2008. 尾形 哲也, 西出 俊, "神経回路モデルの感覚・行為予測に基づく空間認知モデル", 計測と制御 特集 空間知 -私たちの生活を支える脳・身体の拡張空間の創出-, Vol. 48, No. 12, pp. 852-857, 12月, 2009. Shun Nishide, "Object Feature Extraction and Tool Using for Robots with Recurrent Neural Network Model," IEEE/RSJ International Conference on Intelligent Robots and Systems (IROS) Workshop on Cognitive Neuroscience Robotics, Tokyo, JAPAN, November 7, 2013. Yuki Yamaguchi Kuniaki Noda, Shun Nishide, Hiroshi G. Okuno, Tetsuya Ogata, "Learning and Association of Synaesthesia Phenomenon using Deep Neural Networks," in Proc. of IEEE/SICE International Symposium on System Integration (SII), pp. 659-664, Kobe, JAPAN, December 15-17, 2013. Keita Mochizuki Shun Nishide, Hiroshi G. Okuno, Tetsuya Ogata, "Developmental Human-Robot Imitation Learning of Drawing with a Neuro Dynamical System," in Proc. 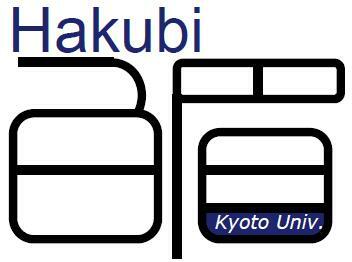 of IEEE International Conference on Systems, Man, and Cybernetics (SMC), pp. 2336-2341, Manchester, UNITED KINGDOM, October 13-16, 2013. Keita Mochizuki Harumitsu Nobuta, Shun Nishide, Hiroshi G. Okuno, Tetsuya Ogata, "Developmental Human-Robot Imitation Learning with Phased Structuring in Neuro Dynamical System," in Proc. of IEEE/RSJ International Conference on Intelligent Robots and Systems (IROS) Workshop on Cognitive Neuroscience Robotics, Pos-3, 6 pages, Vilamoura, Algarve, PORTUGAL, October 12, 2012. Yuki Yamaguchi Harumitsu Nobuta, Shun Nishide, Hiroshi G. Okuno, Tetsuya Ogata, "Tool-Body Assimilation Model using Neuro-Dynamical System for Acquiring Representation of Tool Function," in Proc. of IEEE/RSJ International Conference on Intelligent Robots and Systems (IROS) Workshop on Cognitive Neuroscience Robotics, PM2-3, 6 pages, Vilamoura, Algarve, PORTUGAL, October 12, 2012. Shun Nishide, Jun Tani, Hiroshi G. Okuno, Tetsuya Ogata, "Self-organization of Object Features Representing Motion Using Multiple Timescales Recurrent Neural Network," in Proc. of International Joint Conference on Neural Networks (IJCNN), pp. 1-8, Brisbane, AUSTRALIA, June 10-15, 2012. Harumitsu Nobuta, Kenta Kawamoto, Kuniaki Noda, Kohtaro Sabe, Shun Nishide, Hiroshi G. Okuno, Tetsuya Ogata, "Body area segmentation from visual scene based on predictability of neuro-dynamical system," in Proc. of International Joint Conference on Neural Networks (IJCNN), pp. 1-8, Brisbane, AUSTRALIA, June 10-15, 2012. Harumitsu Nobuta, Shun Nishide, Hiroshi G. Okuno, Tetsuya Ogata, "Identification of self-body based on dynamic predictability using neuro-dynamical system," in Proc. of IEEE/SICE International Symposium on System Integration (SII), pp. 256-261, Kyoto, JAPAN, December 20-22, 2011. Shotaro Sano, Shun Nishide, Hiroshi G. Okuno, Tetsuya Ogata, "Predicting Listener Back-Channels for Human-Agent Interaction using Neuro-dynamical Model," in Proc. of IEEE/SICE International Symposium on System Integration (SII), pp. 18-23, Kyoto, JAPAN, December 20-22, 2011. Hiromitsu Awano, Shun Nishide, Hiroaki Arie, Jun Tani, Toru Takahashi, Hiroshi G. Okuno, Tetsuya Ogata, "Use of a Sparse Structure to Improve Learning Performace of Recurrent Neural Networks," B. -L. Lu, L. Zhang, and J. Kwok (Eds. ): International Conference on Neural Information Processing (ICONIP), Part III, LNCS 7064, pp. 323-331, Springer-Verlag Berlin Heidelberg, Shanghai, CHINA, November 14-17, 2011. Yang Zhang, Tetsuya Ogata, Shun Nishide, Toru Takahashi, Hiroshi G. Okuno, "Method of Discriminating Known and Unknown Environmental Sounds using Recurrent Neural Network," in Proc. of Joint 5th International Conference on Soft Computing and Intelligent Systems and 11th International Symposium on advanced Intelligent Systems (SCIS & ISIS), pp. 378-383, Okayama, JAPAN, December 8-12, 2010. Shun Nishide, Tetsuya Ogata, Jun Tani, Kazunori Komatani, Hiroshi G. Okuno, "Analysis of Reliable Predictability based Motion Generation using RNNPB," in Proc. of Joint 4th International Conference on Soft Computing and Intelligent Systems and 9th International Symposium on advanced Intelligent Systems (SCIS & ISIS 2008), pp. 305-310, Nagoya, JAPAN, September 17-21, 2008. Shun Nishide, Tetsuya Ogata, Ryunosuke Yokoya, Jun Tani, Kazunori Komatani, Hiroshi G. Okuno, "Structural Feature Extraction based on Active Sensing Experiences," in Proc. of International Conference on Informatics Education and Research for Knowledge-Creation Society Infrastructure (ICKS), pp. 209-212, Kyoto, JAPAN, January 16-17, 2008. 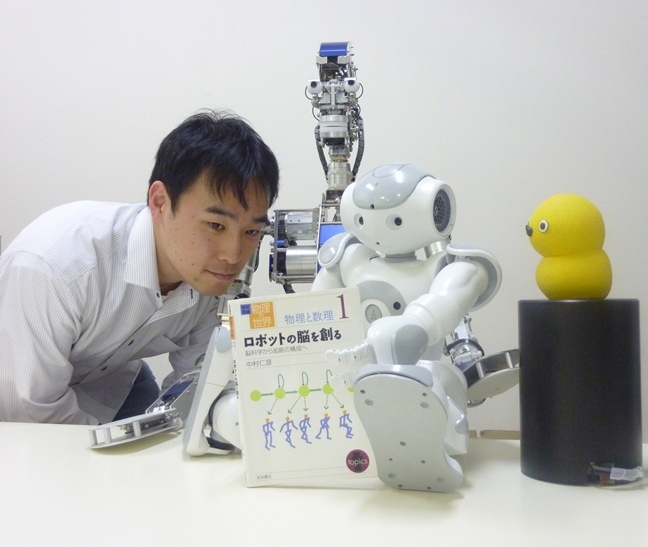 Shingo Maeda, Tomohito Takubo, Shun Nishide, Kenji Inoue, Tatsuo Arai, "Cylinder Detection and Grasping Application Using Humanoid Robot," in Proc. of International Symposium on Automation and Robotics in Construction (ISARC), pp. 517-522, Tokyo, JAPAN, October 3-5, 2006. 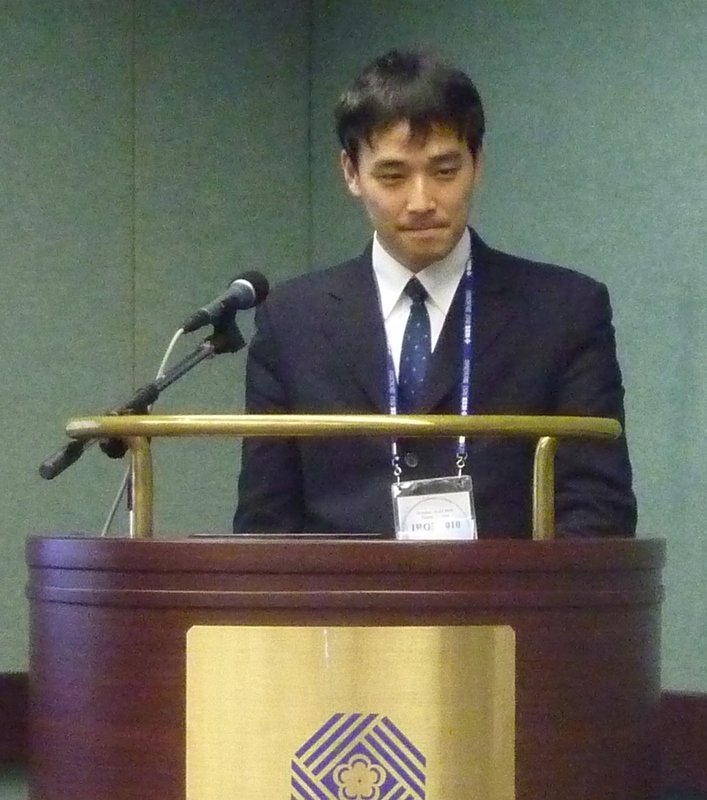 Shun Nishide, Tomohito Takubo, Kenji Inoue, Tatsuo Arai, "Wide Area Recognition for Safety and Security Preserving Robots," in Proc. of International Symposium on Human and Science (SSR), CD-ROM, San Fransisco, USA, March 9-11, 2005. Kotaro Sakata, Tomohito Takubo, Shun Nishide, Kenji Inoue, Tatsuo Arai, "Wheelchair User Support System Using Humanoid Robots," in Proc. of International Symposium on Human and Science (SSR), CD-ROM, San Fransisco, USA, March 9-11, 2005. 西出 俊, 奥乃 博, 尾形 哲也, "スパース再帰神経回路モデルによる人物の行動学習", 日本ロボット学会第31回学術講演会, 2C2-01, 東京, 9月 4-6, 2013. 望月 敬太, 西出 俊, 奥乃 博, 尾形 哲也, "停止動作を活用した描画運動におけるロボットの発達的模倣学習", 日本ロボット学会第31回学術講演会, 1C2-06, 東京, 9月 4-6, 2013. 山口 雄紀, 野田 邦昭 西出 俊, 奥乃 博, 尾形 哲也, "多層神経回路モデルによる共感覚現象の学習と連想", 情報処理学会第75回全国大会, 1R-2, 仙台, 3月 6-8, 2013. 信田 春満, 西出 俊, 奥乃 博, 尾形 哲也, "再帰型神経回路モデルを用いた内発的動機付けによる身体モデルの優先的学習", 第13回システムインテグレーション部門講演会 (SI), 計測自動制御学会, 福岡, 12月 19-21, 2012. 西出 俊, 奥乃 博, 尾形 哲也, "MTRNNを用いたロボットの物体操作における挙動表現特徴量の自己組織化", 日本ロボット学会第30回学術講演会, 3N1-7, 札幌, 9月 17-20, 2012. 信田 春満, 河本 献太, 野田 邦昭, 佐部 浩太郎 西出 俊, 奥乃 博, 尾形 哲也, "神経力学モデルによる自己身体領域抽出と視覚運動系の自己組織化", 日本ロボット学会第30回学術講演会, 2H3-2, 札幌, 9月 17-20, 2012. 山口 雄紀, 信田 春満, 西出 俊, 奥乃 博, 尾形 哲也, "神経力学モデルを用いたロボットの道具身体化機構", 日本ロボット学会第30回学術講演会, 4N3-3, 札幌, 9月 17-20, 2012. 望月 敬太, 信田 春満, 西出 俊, 奥乃 博, 尾形 哲也, "発達的模倣学習における神経力学モデルの段階的構造化と獲得プリミティブの解析", 日本ロボット学会第30回学術講演会, 4N3-4, 札幌, 9月 17-20, 2012. 望月 敬太, 信田 春満, 西出 俊, 奥乃 博, 尾形 哲也, "段階的に構造化する神経回路モデルを用いたロボットと人間の発達的インタラクション", 情報処理学会第74回全国大会, 5ZA-5, 名古屋, 3月 6-8, 2012. 壷内 将之, 尾形 哲也, 奥乃 博, 西出 俊, 信田 春満, "柔軟関節をもつ人間型ロボットにおける神経力学モデルを用いたダイナミック動作の模倣", 情報処理学会第74回全国大会, 5P-7, 名古屋, 3月 6-8, 2012. 信田 春満, 西出 俊, 奥乃 博, 尾形 哲也, "神経力学モデルによる身体図式に基づく空間地図の獲得", 日本ロボット学会第29回学術講演会, 3N1-5, 東京, 9月 7-9, 2011. 佐野 正太郎, 西出 俊, 奥乃 博, 尾形 哲也, "対話データの再帰結合神経回路による学習と相槌タイミング予測", 日本ロボット学会第29回学術講演会, 3O2-1, 東京, 9月 7-9, 2011. 西出 俊, 尾形 哲也, 谷 淳, 高橋 徹, 奥乃 博, "能動知覚経験に基づく物体特徴量の自己組織化と予測信頼性に基づく動作生成", 日本ロボット学会第28回学術講演会, 3A2-05, 名古屋, 9月 22-24, 2010. 粟野 皓光, 尾形 哲也, 西出 俊, 高橋 徹, 奥乃 博, "確信度を用いた物体配置作業における人間ロボット協調", 日本ロボット学会第28回学術講演会, 3J1-06, 名古屋, 9月 22-24, 2010. 西出 俊, 中川 達裕, 尾形 哲也, 谷 淳, 高橋 徹, 奥乃 博, "二次リカレントニューラルネットワークを用いた道具身体化モデルの構築", 日本ロボット学会第27回学術講演会, 2S1-03, 横浜, 9月 15-17, 2009. 西出 俊, 尾形 哲也, 谷 淳, 駒谷 和範, 奥乃 博, "ロボットによるRNNPBを用いた高予測信頼性動作探索とその解析", 第9回システムインテグレーション部門講演会 (SI), 計測自動制御学会, pp. 81-82, 岐阜, 12月 5-7, 2008. 西出 俊, 尾形 哲也, 谷 淳, 駒谷 和範, 奥乃 博, "物体挙動予測モデルによる動画像特徴量の自己組織化", 日本ロボット学会第26回学術講演会, 2N2-04, 神戸, 9月 9-11, 2008. 横矢 龍之介, 尾形 哲也, 西出 俊, 谷 淳, 駒谷 和範, 奥乃 博, "ロボットの順逆モデルの変換による他者行為予測と模倣", 情報処理学会第70回全国大会(IPSJ), 情報処理学会, Vol. 2, pp. 413-414, 筑波, 3月 13-15, 2008. 西出 俊, 尾形 哲也, 横矢 龍之介, 谷 淳, 駒谷 和範, 奥乃 博, "能動知覚経験に基づく物体挙動連想と動作生成", 第8回システムインテグレーション部門講演会 (SI), 計測自動制御学会, pp. 99-100, 広島, 12月 20-22, 2007. 横矢 龍之介, 尾形 哲也, 西出 俊, 谷 淳, 駒谷 和範, 奥乃 博, "自己モデルの再利用に基づくロボットによる他者の発見と模倣", 第8回システムインテグレーション部門講演会 (SI), 計測自動制御学会, pp. 549-550, 広島, 12月 20-22, 2007. 西出 俊, 尾形 哲也, 谷 淳, 駒谷 和範, 奥乃 博, "物体挙動の予測信頼性に基づく自律的な動作生成", 日本ロボット学会第25回学術講演会, 1C36, 千葉, 9月 13-15, 2007. 西出 俊, 尾形 哲也, 谷 淳, 駒谷 和範, 奥乃 博, "物体静止画像から動的特徴を抽出する神経回路モデルの学習と解析", 情報処理学会第69回全国大会(IPSJ), 情報処理学会, Vol. 2, pp. 65-66, 東京, 3月 6-8, 2007. 西出 俊, 田窪 朋仁, 井上 健司, 新井 健生, "ハイブリッドモーションステレオを用いた広域環境認識 -時系列データを用いたモーションステレオの外れ値除去-", ロボティクス・メカトロニクス講演会講演論文集 (Robomec), 日本機会学会, 2A1-N-099, 神戸, 6月 9-11, 2005. 西出 俊, 田窪 朋仁, 井上 健司, 新井 健生, "ハイブリッドモーションステレオによる広域環境認識", 第5回システムインテグレーション部門講演会 (SI), 計測自動制御学会, pp. 865-866, 筑波, 12月 17-19, 2004. ESF-JSPS Frontier Science Conference for Young Researchers 2007 (平成19年度日本-欧州先端科学セミナー), 湘南国際村・国際会議場, 神奈川, 3月 9-15, 2008. IEEE-RAS/IFRR School of Robotics Learning, Lazise, Garda Lake, Italy, September 24-28, 2007.